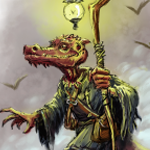 Paizocon may be over, but our enjoyment of it certainly is not! Mike Welham braved the lovely weather and terrific gamers of the Northwest to run Shadows of the Dusk Queen for some Pathfinders ready for action. Sounds like they had a wonderfully fun time—and even had a surprise teammate in the form of artist Bryan Syme. 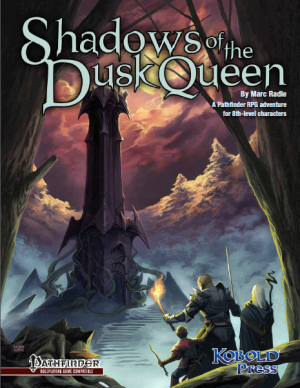 Part 1 of Shadows of the Dusk Queen saw seven players at the table, including primary illustrator Bryan Syme. I didn’t make the connection about this guy who showed up asking if I minded him joining the table until he volunteered to retrieve a copy of the actual module from Wolfgang. Once I realized I was running the game for one of the module’s luminaries, I shared that information with the rest of the table, possibly to Bryan’s chagrin. I set the beginning of the scenario at a village named Duskvale, whose residents were displeased with adventurers. The previous group that passed through had learned about the Dusk Queen’s return and promised to put a stop to it. They never returned from their journey into the forest, and they invited the wrath of the Dusk Queen’s agents on the village. It took a lot of convincing of the village mayor to take the job, but the party succeeded while simultaneously keeping the murderous gnome from stabbing hated humans. The first denizen they ran into was the weeping treant, who provided his cryptic message regarding the location of shards belonging to the Dusk Queen’s mirror. Realizing they could use these shards to put an end to the Dusk Queen and collect their modest reward from Duskvale, the PCs set off for their first stop at the shadow nymphs’ pond. Surprisingly, the party again proved adept at diplomacy and left the nymphs alive and with the shard in their possession—but not before Gob the half-orc fighter expressed his desire to witness the nymphs’ “true beauty,” causing him to become staggeringly blind. Fortunately, one remove blindness later, Gob was back to full capacity. They then made their way to the dark naga’s lair nestled in a circle of standing stones. Once again, Gob proved to be an agent of chaos as he inadvertently triggered the symbol of stunning that protected the standing stones, making it very easy for the naga to fireball the clustered and stunned party at will. The gnome managed to shake off the effects and played a game of “keep away” with the shard, forcing the naga to use her gaze to charm him into returning the shard. Eventually, though, the party prevailed over the naga and retrieved the second shard. The search for shard number three took them to the ominous hanging tree. Gob managed to knock the third shard from the tree and subsequently attract the attention of its undead guardians. The battle proved harrowing and drained the life from a couple of PCs, but they prevailed in the end. It was not quite so easy as their combat with the hobgoblins, whom they took completely by surprise. And the half-dragon was resilient, but he ended up not being much of a challenge considering all his minions died in the first round of combat. Finally, they carefully made their way down a chasm to fight the powerful shadow drake guarding the final shard. The battle was fierce, but they survived, considerably wounded and out of resources but triumphant. As per their deal with the mayor of Duskvale, they returned with the shards as “proof” of their victory over the Dusk Queen. Unfortunately, this decision provoked the queen’s ire, and we ended with the cliffhanger of the weeping treant emerging from the woods to destroy Duskvale and the interloping characters. 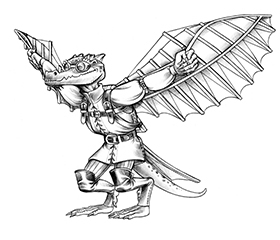 Part 2 opened with three new adventurers (and, with the exception of Bryan Syme, five new players), including two mighty paladins, who had to resolve the situation wrought by their previous actions. The treant, with the help of shadow stirges, brought a couple of characters low, but they proved victorious. The mayor of Duskvale greeted the victory over the weeping treant with disdain and kicked the PCs out of the village. Seeking to blackmail… er… obtain a reward for their services from another village, they skirted the woods surrounding the Dusk Queen’s tower and attracted the attention of a pack of shadow mastiffs. Undaunted by the mastiffs’ fearful howls, they put the unearthly dogs to the sword, axe, and several arrows. After agreeing on a price for finally dispatching the Dusk Queen at the next village, the adventurers returned to the woods. The Dusk Queen had a surprise waiting for them in the form of a dead behir now imbued with her power to return as a shadow creature. The behir proved to be a mighty foe and ripped apart two of the PCs (including poor Gob the half-orc) before falling. Fortunately, a couple of adventurers from the previous part had a change of heart and met up with the surviving characters to bolster their ranks before the assault on the Dusk Queen’s tower. The PCs proved resistant to the queen’s demands to give her the shards, but at the first sign of attack, the queen and her graveknight protector launched a counterattack, felling Adonia, who had the misfortune of being in the wrong place at the wrong time, with a lethal blade attack and a cascade of ice shards. The epic combat required the surviving paladin to make liberal use of smite and the zen archer to enter a state of rage and expend all his ki points to finally rid the world of the Dusk Queen… or so they think. Thanks for running it Mike! I usually don’t do games at conventions, but I had to get in on this one. You did a great job! I’m glad you got to join us, Bryan. It was a real treat to show off your illustrations! Also, Gob was a delightful addition to the table (while he lasted). How many rounds did we let that naga hammer us with AoE?!? Felt like an eternity! It was great gaming with both of you!